The term acapella refers to singing without any accompaniment by instruments. The word is Italian, and means, ‘of the chapel’. It refers to early sacred music, when instrumentation was not permitted inside the church, and specifically the chapel. Only human voices were permitted, and thus acapella music was created. There is something truly unique about the human voice. To hear it by itself, without other instruments distracting the ear, can often be a very intimate and human experience. It allows an audience to truly appreciate the breadth and beauty of the voice. Singing acapella music, is a unique opportunity for singers to focus on intonation in a manner that is much more internal than when singing with instruments. Without an instrument to act as a tether, singers focus on tuning their voices to one another, creating a wonderful resonance of tone, and even heartbeats! As discussed in the post, Math and Science in Music – Harmonics, different instruments create a series of different pitches above the fundamental pitch, called overtones. These pitches create the unique timbre of different instruments, and nowhere is this more evident than in the human voice. The full timbre of rich overtones in the human voice can be heard to greatest benefit when singing is acapaella. 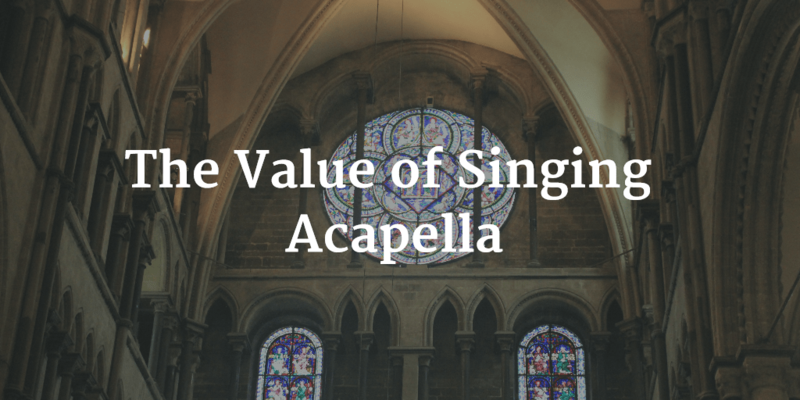 Why else might it be valuable to sing acapella? Tell us in the comments below!